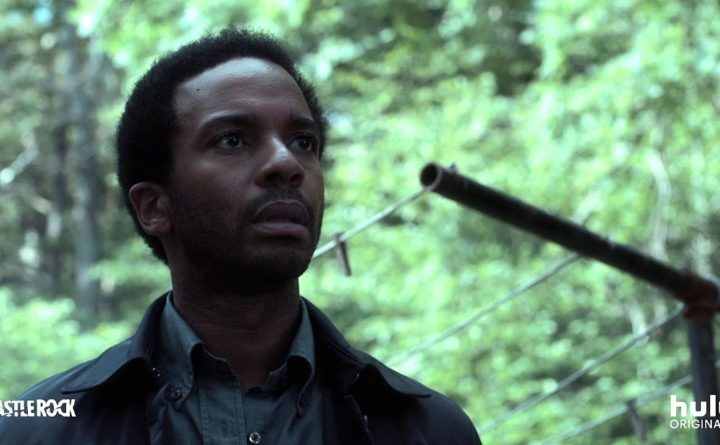 Andre Holland in "Castle Rock"
The couple that “Castle Rock” focuses on for much of episode eight are probably the most Stephen King-esque couple that King himself never wrote. They’ve got it all: a rocky marriage they’re trying to save by getting into the hospitality business, an interest in the macabre, a creepy old house in Maine and, eventually, blood. Lots and lots of blood. Why not throw an ax in there for good measure, too? Gordon and Lilith, who were introduced in episode four as potentially interested in buying Warden Lacy’s old house, are seen here after they’ve purchased it and moved in. In an attempt to repair the wounds caused by Lilith when she cheated on her husband, they decided to turn the old Castle Rock house into a bed and breakfast themed to the many gruesome murders that have happened in the town. Considering the fact Warden Lacy imprisoned The Kid at Shawshank for 27 years — something that clearly drove him mad, judging by the museum’s worth of portraits he painted of The Kid — things can’t go well. As an aside, it is worth noting here that while the scenes involving Gordon and Lilith and their new B&B are creepy and often gripping, they are rife with plot holes and sloppy writing. Who doesn’t check out the basement before buying a house? Who doesn’t lock their front door after chopping up bodies following a double murder (thus allowing the underused character of Jackie Torrance to make an appearance)? Who wants to share a couch with a mannequin? Yeesh. Speaking of double murders: There is one! Haunted by his wife’s infidelity and controlled by the malevolent forces that come with The Kid, Gordon slashes their very first B&B guests to ribbons, and is found by Lilith covered in blood, saying he has no idea what came over him. Meanwhile, the telepathically attuned Molly has sensed that Henry is in danger. When we last saw Mr. Deaver two episodes ago, he was locked in a soundproof box, trapped there by the mysterious Odin and his translator, Willie, in an attempt to force Henry to really listen to the “music of the spheres” or the “schisma” or whatever supernatural, terrifying sound it is that’s emanating from the woods. Molly rescues Henry — perhaps offing Odin in the process — and brings him back to the Deaver homestead, where of course the night prior the tragic events unfolded involving his mom, Ruth, and Alan Pangborn. The Kid has also returned to the house (after torching a mental hospital). He shows Alan’s body to Henry, and then tells him that he rescued Henry from a basement 27 years ago. Say what? The twin storylines (Henry’s and the B&B couple) dovetail when Henry decides to break into the couple’s house to look for clues about The Kid. There, he finds the many paintings Warden Lacy did — and he finds the couple. Lilith attempts to kill Henry, and a scuffle ensues, with Henry fatally stabbing Lilith in the neck, and then Gordon chasing Henry out of the house and getting him on the ground, a butcher knife in hand. Jackie arrives, just in time, and as befitting her last name (Torrance, since she’s apparently the niece of Jack Torrance from “The Shining”) clocks Gordon in the head with an ax. Goodbye, Castle Rock Historic Bed & Breakfast. We hardly knew ye. The episode ends with two important scenes. Wendell, who has gotten on the bus back home to Boston, finds himself hearing the noises his father hears, and gets off the bus halfway, to find his way back to Castle Rock. And finally, Molly — drugged out on pills in an attempt to quell her telepathic headaches — is seen driving to her childhood home. There, she finds The Kid, sitting on the staircase. He begins to tell her things about her childhood that he couldn’t possibly know unless … he was there? What does it mean? I bet you we find out on Hulu’s next episode. The streaming service releases new episodes at 12 a.m. on Wednesdays, and only two more Castle Rock episodes remain this season. In case you didn’t notice, The Kid says he rescued Henry from a basement 27 years ago. Pennywise from “IT” returns every 27 years. Coincidence? Probably not. If you look really, really closely towards the end of the episode, when Wendell gets off the bus, you’ll see he’s in the town of Jerusalem’s Lot, a.k.a.“Salem’s Lot,” the home of the vampire Kurt Barlow, in the classic King novel of the same name.